Hope you’ve all been having a fantastic festive break! I’ve been having a fairly enjoyable one, at any rate. Lots of games, lots of playing with plastic. Which brings me on to today’s blog, as I want to talk about some stuff that I’ve been enjoying for a while now: Space Marines! First, a little history. Since my discovery of my love for Warhammer 40k, I’ve been almost entirely focused on the Necrons. However, earlier in 2015, I decided to try to paint the Space Hulk boardgame, and bought some kits to practice on – specifically, the old Space Marine assault squad. I assembled the squad, but didn’t actually do anything more with them. As the year went on, I became more interested in Space Marines, due to a perception that they aren’t often played. Certainly in my meta, it seems to primarily consist of Imperial Guard and Eldar. Anyway, I began to look at the various kits, and watched a few batrep videos online, and decided I’d collect some of them, as they looked like they could be a lot of fun. So having decided to collect an army, I was then faced with the task of deciding how to paint them. As it turned out, it didn’t take long to decide – again, under the impression that Ultramarines are almost frowned-upon as being too-prevalent, I was instantly attracted to the chapter, and here we are! I’ve already mentioned the first two novels in the Ultramarines series (links at the end of this blog). While those books have been really excellent, I’m more attracted to them because of the Ancient Rome flavour they all have. The captains have a vaguely Centurion look to them, especially the helmet crests and the leather pteruges. Being very much interested in Ancient Rome, I really like these bits and pieces. So I’ve been off-and-on working on getting a Fourth Company assembled, echoing the adventures of that company in the novel series. Something that I’ve immediately noticed in doing this is just how much attention needs to be paid to military protocols. For those who don’t know, some more history. Thousands of years before the 41st Millennium, the Emperor created twenty Primarchs to lead legions of super soldiers, called the adeptus astartes or space marines. During the cataclysmic Horus Heresy, several of these Primarchs rebelled against the Emperor’s dominion and succumbed to the warping power of Chaos. These traitor legions are now referred to Chaos Space Marines, while those loyalist legions were re-organised into Chapters, much smaller than the legions, in an attempt to curb any future civil war. This was all undertaken under the direction of Roboute Guilliman, Primarch of the Ultramarines, who decreed these reforms in the famous Codex Astartes. Post-Heresy, the Ultramarines were said to be the largest Legion, and so fractured into several “successor chapters” during the reorganisation, known as the second founding. Each of the remaining loyalist legions also saw several successor chapters, of course, though the Ultramarines, being the largest, saw the most of these. Which was an ideal way to spread the word of the Codex. This history has appeared to inform the game, which sees the Ultramarines almost as the ideal, perfect example of what a space marine ought to be. As such, I’ve been particularly concerned with making sure my space marines follow the correct protocols. For instance, the fourth company consists of six tactical squads, two assault squads, two devastator squads, and four dreadnoughts, along with a chaplain, an apothecary and a captain. Each company within the chapter has a specific colour trim – green for fourth – and distinct squad markings that I’m also keen to preserve. So while for my Necrons – and even the Stormcast Eternals I’ve been putting together over the summer – I’ve been painting them as I see fit, I’m really concerned to have my space marines “correct”. It’s a different way of painting models, which I normally look upon as a way to exercise the imagination, but it’s been quite rewarding so far to see something come together like this. In the middle of all of this, however, I’ve had a kind of side-project emerge. I said earlier that this whole thing started by my desire to paint the Space Hulk game. Part of this has been a particular interest in painting Space Marine terminators. I managed to get some Deathwing kits in the Black Friday extravaganza at Games Workshop early in December, which really helped to fuel this. 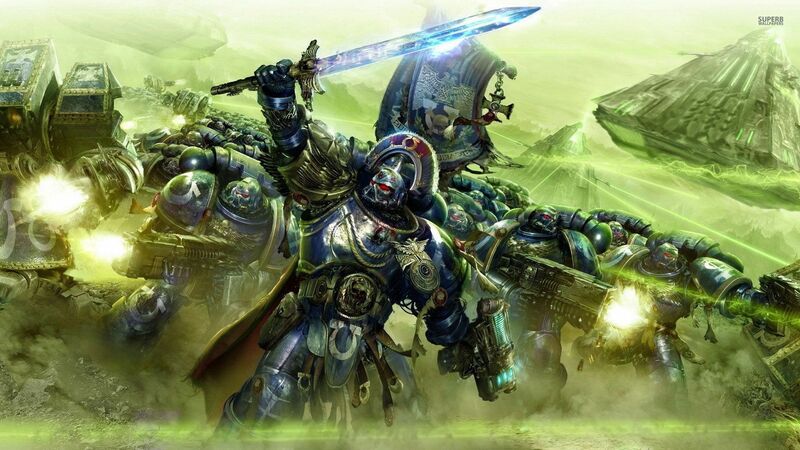 Ultramarines are the XIII legion of space marines; the first legion are the Dark Angels. 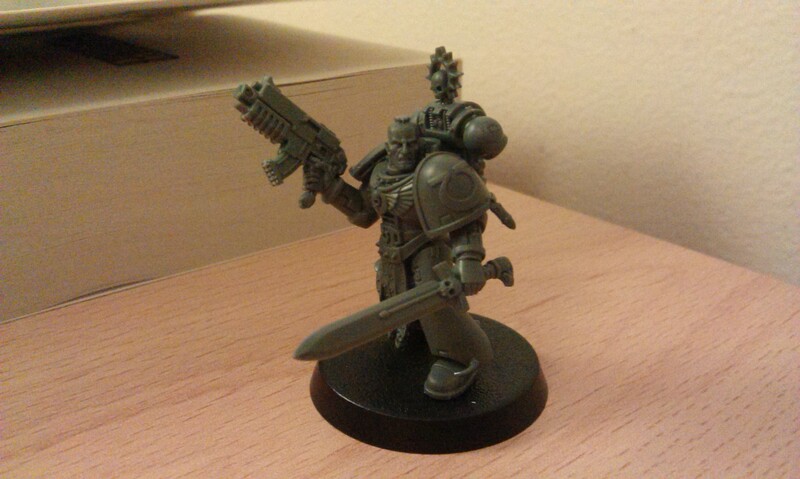 Common to space marine chapters is a veteran squad as its first squad, and terminators are classed as veterans – the exception being the Grey Knights, whose entire chapter can be outfitted in the bulky terminator armour. 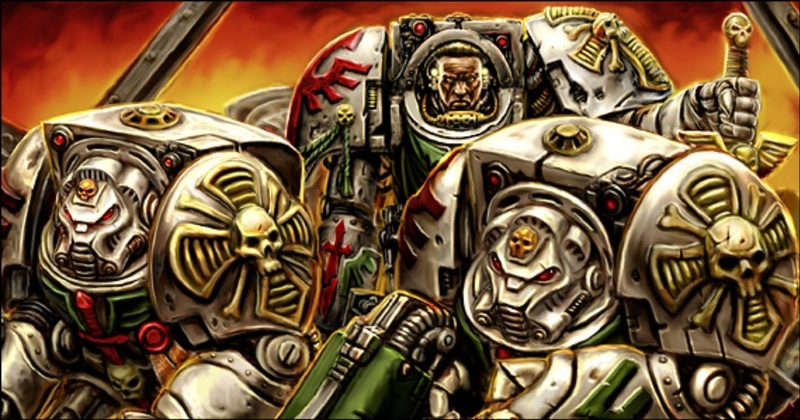 For the Dark Angels, the first company is known as the Deathwing, and is entirely made up of terminator squads. I’m not sure what it is about these chaps, but I really like their look! In particular, I like the creamy look of the Deathwing, offset with green and red bits. So I’ve also been working on some of these guys, among the rest of my ongoing projects! But that’s not all – because I’ve built up a third squad of terminators, this time painted as Genesis Chapter, the first of the Ultramarines’ successor chapters. I’ve said it before of course, but I enjoy painting miniatures for the way it exercises the imagination and promotes creativity. Part of this comes from trying out new things, and while it has been difficult to find the colour scheme for these chaps, it’s been very interesting for me to try these out. I mean, I’ve painted lots of silver men (Necrons) and lots of gold men (Stormcast Eternals), so getting to paint blue and red and cream men is yet another challenge that I’ve been excited to take up! I bought myself a Razorback tank for Christmas, which has been yet another challenge that I have relished. The biggest models I’ve put together so far have been the Catacomb Command Barge for the Necrons. Building a plastic box has been very interesting, and I have to say I love the way this has turned out. I’m still building way more than I’m painting, as the building is still the part of this hobby that I enjoy the most, but I’m hoping that 2016 will finally see me realise all of these bits of plastic as a true Ultramarines army – with support from the Dark Angels Deathwing and Genesis Chapter! Next Next post: Horror Under the Pyramids!